The world is getting smaller and smaller. Jet liners, bullet trains, the internet and new international markets are blurring the lines on our old maps. Our future is changing. The world that our children grow into isn't going to be the one of ours or our parents. That's why it's time to take the future seriously. Parents, grandparents and teachers need to put on their "game faces" and have a serious talk about bilingualism. When a child is bilingual, their mind opens up to an entirely new world. We know that in this ever-changing global economy, those fluent in more than one language have better odds at a brighter future. The United States has seen a rapid change in language and culture over the last century that has facilitated the growth of professional bilingualism in the public and private sectors. To put it into layman's terms: bilingualism = jobs. Translators have always been an important component at every level of government and business. But translating isn't the only profession that requires the mastery of another language. Today, educators and medical professionals often find themselves in situations that require the use of a language other than their native tongue. Complex global affairs have caused leaders to identify a need for bilingual talent within the government. Corporate outsourcing has increased the amount of multilingual interactions in the business world. Many nations around the world are rising as economic superpowers - such as Russia, China, and India - and to learn the languages of such nations increases the desirability of any potential hire. You must be wondering...how are these things relevant to my child now? Foreign language careers are on the rise. When your bright-eyed three-year old graduates from college, she'll enter into a job market in which multilingualism is a highly sought after skill. Research done by Korn/Ferry International stated that over 66% of North American recruiters felt that being bilingual would become extremely important over the next 10 years. Today, many HR departments require eligible candidates to be bilingual. If you look on any job posting website, you will likely see hundreds of jobs - even part-time work - that require bilingual candidates. Language learning is proven to "feed the mind." Learning another language gives kids an educational edge over monolingual peers. Longitudinal studies at Harvard suggested that language learning "increases critical thinking skills, creativity, and flexibility in children." Speaking more than one language can help kids with planning and problem solving. It also helps children with attention and cognition. According to Psychology Today, children in bilingual environments perform better on standardized tests and have better academic performance in general. To give your kids a leg up in a competitive educational environment as well as the job market, it's imperative that language immersion starts now. Getting your child started in language learning can give them the skills they need for a secure future. At Little Pim, we're here to help you through that journey by giving you the tools that you need. If you have questions about how Little Pim could benefit your child, or about the benefits of language learning, don't hesitate to contact us or comment below today. We live in an increasingly global world where learning a second language can give your child many advantages. Learning a foreign language at an early age improves overall fluency, but the issue is that most schools do not offer the opportunity to learn a second language until high school. According to Forbes magazine, we have a "foreign language deficit" in our country, especially when we are compared to other countries. Overseas, most countries require their students to learn English as a second language from a young age. When researching the benefits of bilingualism, it seems that the pros are endless; speaking more than one language can improve social skills, school performance, emotional health, and so much more. With all of the positives that come from being bilingual, it's a wonder that more young children are not being raised bilingual. According to a study performed by Stanford researchers on language, the language children are exposed to in infancy and early childhood has a massive impact on their academic abilities and ability to communicate later in life. The best way to set your child up for success is to teach them both their native language, alongside a foreign language, during the critical period between infancy and six years old. Bilingual children have been proven to score higher on tests throughout their entire school career. In a piece exploring the superior social skills of bilingual children by Katherine Kinzler, published in the New York Times, she found that children who are bilingual or multilingual have an easier time understanding different perspectives. This is because they have to understand when to speak a certain language, and to whom. This greatly improves their ability to communicate and empathize with people from all different walks of life. For more information about this study, check out our blog post on "Raising a People Person." According to a study performed by the University of Strathclyde’s School of Psychological Sciences and Health, children who speak two languages statistically scored higher when it came to creative thinking and problem solving. Bilingual children scored much higher than monolingual children all across the board, in fact; especially when it came to questions assessing their critical thinking skills. In other words, bilingual children's ability to think outside the box helped them eventually work out answers to questions that they otherwise may not have been able to answer. Language plays a large role in our emotional health, because it is the only way we can articulate our deepest feelings, whether we choose to write them in a journal or discuss them with friends and family members. The ability to express their emotions in more than one language offers children more opportunity to talk to more people; it's also a good way to vent their emotions when around those who are monolingual. Also, when observed in school, bilingual children showed a better ability to pay attention and exhibit inhibitory control. It has been shown that bilingual children tend to have better relationships with their teachers and peers as well. Those early experiences with teachers and friends are vital to a child's emotional health and social development; teaching your child a second language can help ensure those interactions will be positive ones. Bilingual children often have a natural curiosity about the country from which their second language originated. From a very young age, they have also been shown to be more tolerant of other cultures; they play more easily with children who come from different socioeconomic backgrounds, they are more likely to engage in play with children who do not speak their language, and they show more of an interest in socializing outside of their usual social circles. Since our world is becoming more globalized every day, the ability to tolerate and show interest in other cultures is an important advantage. There are endless benefits to teaching your child a second language from an early age - this article has only covered a small handful of the advantages your child will get through becoming bilingual! If you would like to introduce your child to a new language, try out Little Pim for free by watching a demo video to get started as soon as possible! It's proven that the best time to learn a new language is under the age of 6. New studies from the University of Washington's Institute for Learning and Brain Sciences indicate "the notion that not only are very young children capable of learning multiple languages, but that early childhood is the optimum time for them to begin." Our results suggest that before they even start talking, babies raised in bilingual households are getting practice at tasks related to executive function. This suggests that bilingualism shapes not only language development, but also cognitive development more generally, said Ramirez. It's amazing to see the results from the brain-recording technique used in the study called magnetoencephalography. "The brains of bilingual babies were specialized to process the sounds of both languages, Spanish and English. The brains of babies from monolingual families were specialized to process the sounds of English and were not sensitive to Spanish," says Ramirez. No surprise there! What's more interesting is that as early as 11 months old, we're able to see that the bilingual brains showed increased activity in areas related to executive functioning. According to The Center on The Developing Child at Harvard University, when children have the opportunity to develop cognitive skills early on, individuals and society experience lifelong benefits. Executive function and self-regulation skills are the mental processes that enable us to plan, focus attention, remember instructions, and juggle multiple tasks successfully....Providing the support that children need to build these skills at home, in early care and education programs, and in other settings they experience regularly is one of society’s most important responsibilities. 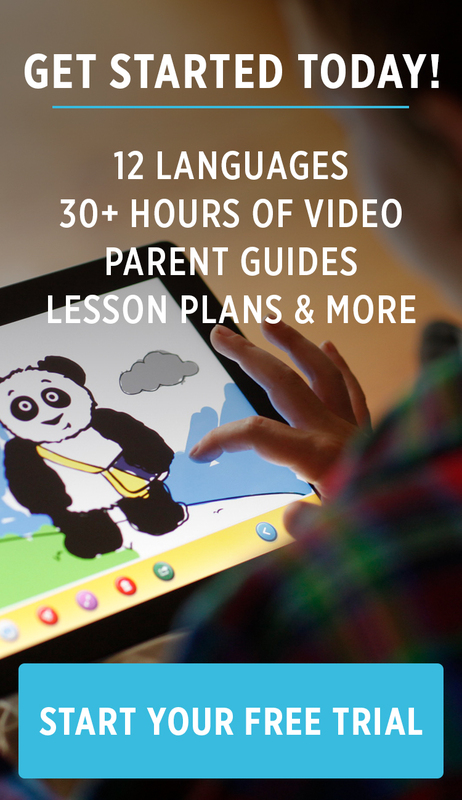 Are you ready to teach your little ones a new language? Check out the research behind our method to learn more about how we integrate scientific studies like these to help kids effectively learn languages, both native and foreign.